There are so many versions of this glider throughout the world. Most sailplane manufacturers made a version of it at some point. Here we have a superb 1/4 scale example of the machine which is the epitome of pre-WW2 vintage open cockpit gliders. 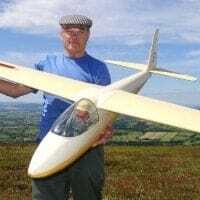 Cliff Charlesworth has captured this aircraft with a radio-controlled model glider that reproduces the looks and performance of the original sailplane. A really good project for all you scale boys (and girls) that like their scale soaring. 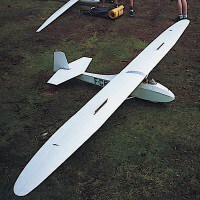 133.5″ (3390mm) wingspan. Two sheet plan. 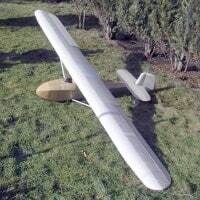 The Schneider Grunau Baby was a single-seat sailplane first built in Germany in 1931, with some 6,000 examples constructed in some 20 countries. 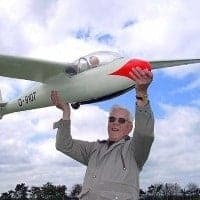 It was relatively easy to build from plans, it flew well, and the aircraft was strong enough to handle mild aerobatics and the occasional hard landing. When the Baby first appeared, it was accepted wisdom that the pilot should feel as much unimpeded airflow as possible, to better sense rising and falling currents of air and temperature changes etc. It was designed by Edmund Schneider with the assistance of Wolf Hirth and Hugo Kromer as a smaller version of Schneider’s ESG 31 of the previous year, incorporating an elliptical wing design based on work done by Akaflieg Darmstadt. It was named after Grunau, the town where Schneider’s factory was located, now Jeżów Sudecki in Poland. The first 14 inner ribs were of the Göttingen 535 shape with the outer ribs gradually changing up to the last 22nd rib, having a bi-convex and symmetrical shape with a slight reduction in the angle of incidence. The tips and leading edges of the wings up to the main spar were covered with plywood. The tail unit was built of plywood. The intention was to create an aircraft suitable both for training and for cross-country soaring. Typical for its day, it was a high-wing braced monoplane with a fuselage of hexagonal cross-section and an open cockpit. The Baby was an instant success, and was enthusiastically promoted by gliding champion Wolf Hirth. An extensive redesign was undertaken in 1932 following the fatal crash of an unrelated Schneider design, which resulted in the Baby II. 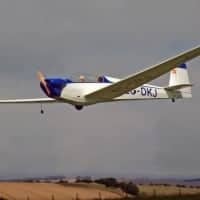 This version and the definitive Baby IIb that followed were adopted as standard sailplane trainers for the German Air Sports Association (later the National Socialist Flyers Corps). During 1941, 30 GB gliders were built by Laminação Nacional de Metais, later Companhia Aeronáutica Paulista in Brazil, under the name “Alcatraz”. Following World War II, series production restarted in Germany in 1956. The Baby was also built in France (as the Nord 1300) and the United Kingdom (as the Elliotts Baby EoN and the Slingsby T5 – Slingsby also used it as the basis for a number of their own designs). Edmund Schneider emigrated to Australia, where he developed the Baby design into his Baby 3 and Baby 4, which had enclosed cockpits.